It snowed last week, yet I got a sun burn over the weekend. Oh how I love Spring! I always feel slightly confused this time of year. I never know what coat to wear, whether to pack my umbrella with me when I leave for work, or what meals I feel like eating. My body still craves warm winter comfort food, yet is totally tantalized by images of fresh spring produce. That's where this burrito bowl comes in. 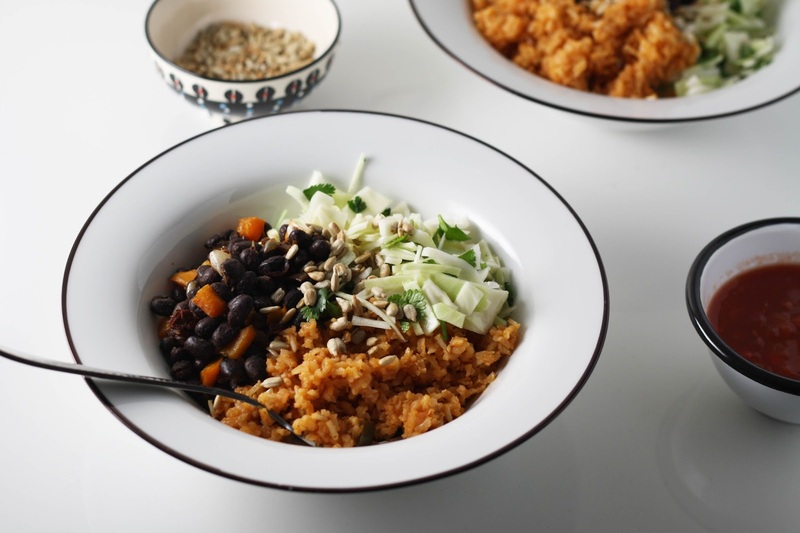 Comfort from the mexican-style rice, warmth from the spicy beans, and fresh spring crunch from the slaw. A perfectly harmonious combination that we've been eating on repeat around here lately. I hope you enjoy it as much as we do. I didn't have a ripe avocado when I took these photos, but do try to track one down. Avocado makes all Mexican-inspired recipes that much better. 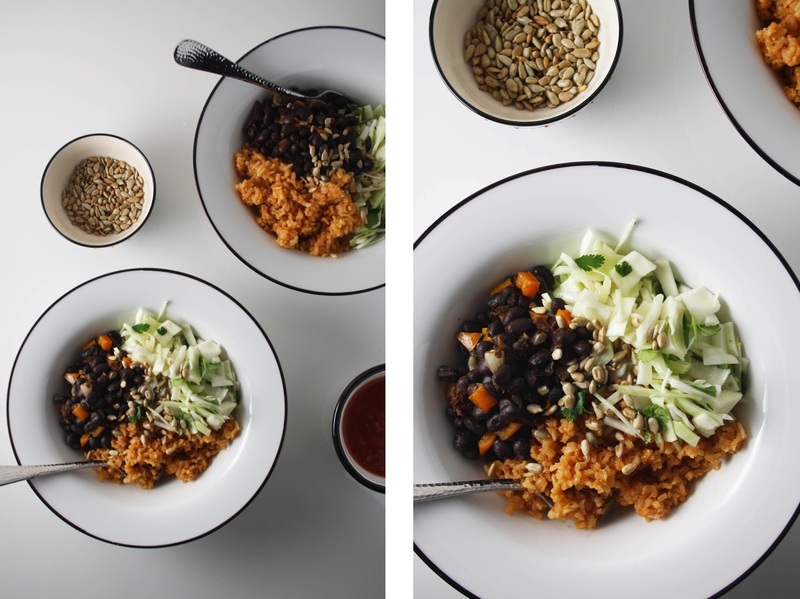 As for sequencing -- get the rice going first, then whip up the beans and slaw while the rice is cooking. Oh, and if a giant bowl of burrito fillings ain't your thing, by all means, roll it up! 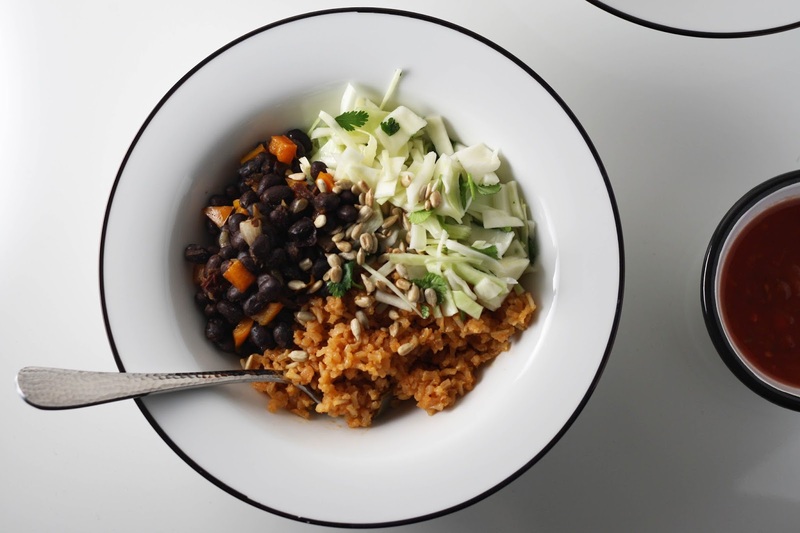 Combine equal parts rice, beans and slaw in a deep bowl. Sprinkle with desired toppings and sauces. If there are leftovers, best served at room temperature. Combine tomatoes and onion in a blender and puree until smooth. Transfer to a medium saucepan and add the stock, cumin and salt. Bring to a boil over medium-high heat. Heat oil in a heavy-bottomed dutch oven over medium heat. 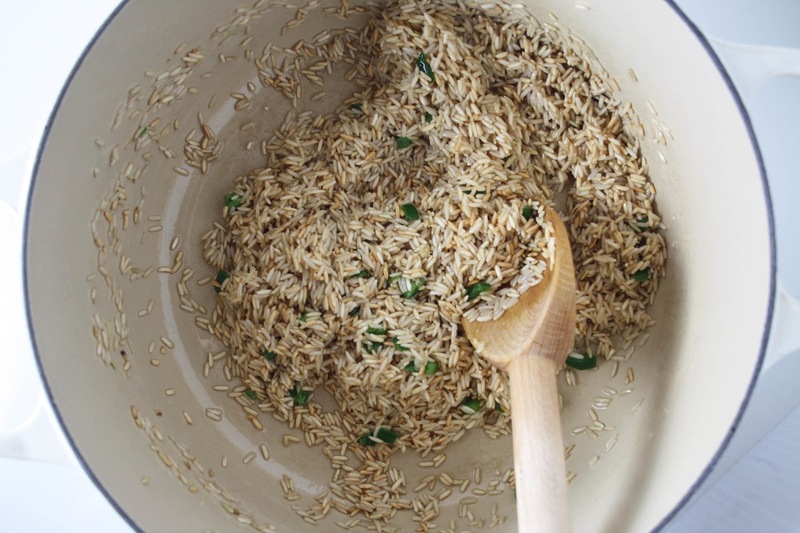 Once hot, add the dry rice and sauté until browned and fragrant, 5-7 minutes. Add jalapeños and garlic, and cook until soft, about another 1 minute. Lower heat if necessary to avoid the rice getting burnt. Pour the boiling tomato mixture over the rice, stir to combine and bring to a boil. Reduce to a low simmer, cover, and cook for ~40 minutes, until most of the liquid is absorbed and rice is cooked. The rice will stay slightly crunchy due to the toasting. Once ready, stir in the lime juice, and fluff with a fork. Set a frying pan over medium heat, with 1 T olive oil. Once hot, add the onion and sauté for 2-3 minutes until it begins to brown. Add peppers, beans, ancho chilies and adobo sauce. Mix everything together and allow to cook for 5 minutes, until the beans are warmed through.